There are numerous property portals and numerous listings out there for Irish homes. Wading through them can be time-consuming – which is why it’s so important to target your search right from the beginning. By deciding on the type of home you’re looking for, you and your estate agent will be able to concentrate on a much smaller sets of homes that definitely do fit your requirements. 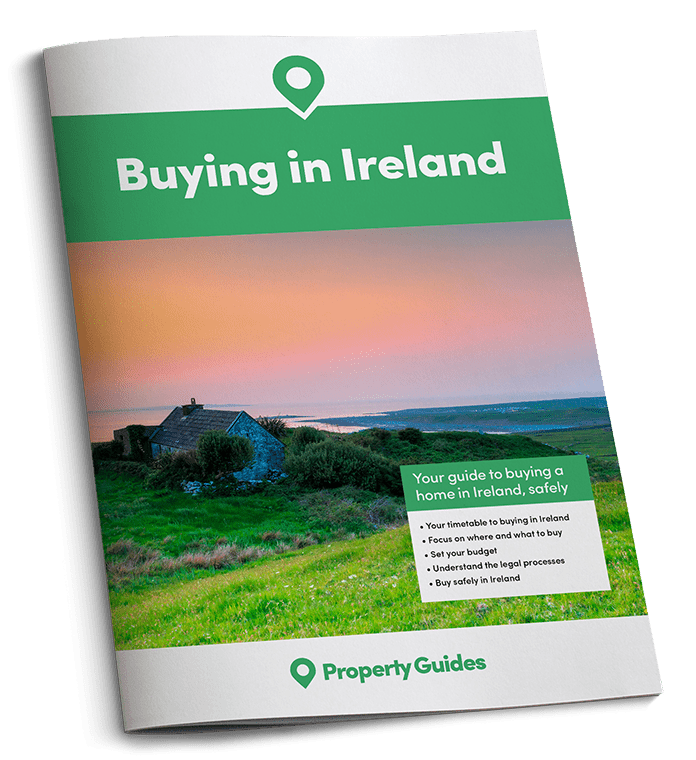 So, what are the main types of property in Ireland? Keep reading to find out. Ireland shares a lot of its architectural heritage with the UK, so many of these types will be familiar. 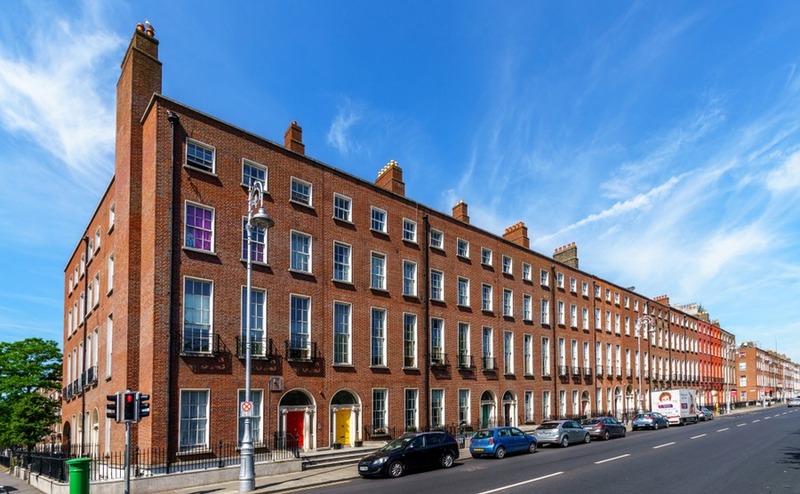 However, Ireland’s gone through a different past to its neighbour, which has led to a different distribution of styles among its housing stock. Many buyers are surprised at the prevelance of Georgian homes in Ireland – this is due to the 1700s being the time when more and more Irish moved into towns from small crofting villages. Equally, the island didn’t suffer as much damage in the First and Second World Wars, so spacious terraces and 19th-century workers’ cottages are still abundant. Finally, the ‘Celtic Tiger’ boom means the island almost has a surfeit of new-build homes. Named after King William III – whose memory is now more controversial in Ireland – this style is reminiscent of Dutch and Belgian architecture. Homes are generally tall and narrow in long terraces, with features like stepped or pedimented gables. They’re quite rare today, as their busy lines became unfashionable in the 1700s. Many remaining ones have been converted into flats. These are the most common period types of property in Ireland. Between the mid-1700s and very early 1800s, much of Dublin was rebuilt. These elegant homes still survive today and are popular for their large windows, spacious rooms with high ceilings and symmetrical facades. In Dublin and Limerick, you’ll find some at the upper end of the market sitting around quiet squares. In the late Georgian period, the style began to filter down to working-class neighbourhoods. An interesting particularity of the Irish style is that many homes had the bedroom and kitchen on the ground floor and living room on the top floor. Most of these also have basements – hand for conversion into entertainment rooms like home cinemas nowadays! The Victorian “workers’ cottage” can be found in all Irish towns and cities. As in the UK, these are largely redbrick homes of a single room’s width, often connected directly to the street. Smaller than many other home types, they’re nonetheless often located in convenient sites within easy reach of the town or city centre. A style that’ll be familiar to any British buyer, these largely Edwardian homes imitate an earlier Tudor style. Normally semi-detached with bay windows letting in plenty of light, they have details such as faux wattle and daub exteriors to give a historic look. Many have ample garden space, both at the front and the back. The Dublin Corporation (‘the Corpo’) was a prolific housebuilder in the 1920s and 30s. It built to standardised designs of two- and three-bedroom homes. Relatively spacious, many still survive today as Ireland remained more or less neutral in the wars of the 20th century and so didn’t experience the bombing of many British cities. 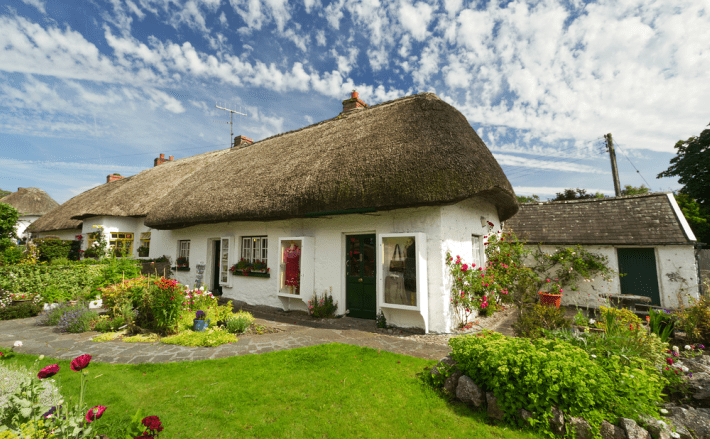 Many expats who make the move to Ireland opt for country properties that afford them the peace and quiet that they seek. Traditional rural homes are not dissimilar to those in the west of England and Scotland, as well as in Wales. They’re generally white, with traditional layouts described as being like an L, a T or a U. The typical rural types of property in Ireland are small – around 700-1000ft2 – and narrow. This means many do have modern extensions, some with more sympathetic finishes than others. Some also have outbuildings, such as barns, which could be converted as storage or even as a second property to let out. The ‘Big House’, as stately homes in Ireland are largely known, is a grand mansion, often built by Anglo-Irish aristocracy. Many fell victim to demolition in 1919-1923, but there are still a great number dotted around the countryside. A lot of their original owners sold them in the 20th century and you’ll still find some coming up for sale nowadays. Although most go for many millions, you can surprisingly find some stately homes for just €700,000. If you’re buying with the intention to let your property, on a long-term basis or as a short term holiday rental, you need to consider this plan when choosing where and what to buy. It will pay to consider tourist footfall, nearby attractions and facilities, proximity to an airport, and whether the property will appeal to renters, i.e. is it close to public transport? Is it in a fashionable part of the city? What type of property do you see yourself living in? A new build apartment, country farmhouse, family home? What size does it need to be? How many bedrooms? How many bathrooms? Would you prefer to live in a new or older property? If old, are you happy to manage a renovation, or is a redecoration more in line with your plans and budget? Do you need off road parking? A garden? An annexe? Maybe you are looking for some land? Once you’ve established what matters to you in the property you seek, take a look at popular property portals. This will help you to confirm your findings and to identify the kinds of properties available in your chosen area, for the price you’ve budgeted. When you’re ready, contact our Resource Team on 020 7898 0549, and we’ll put you in touch with our trusted estate agent in Ireland, or fill in the form to be put in touch with a trusted firm.